Eat Your Heart Out, Google. Beijing's Got a Better Bus Map. 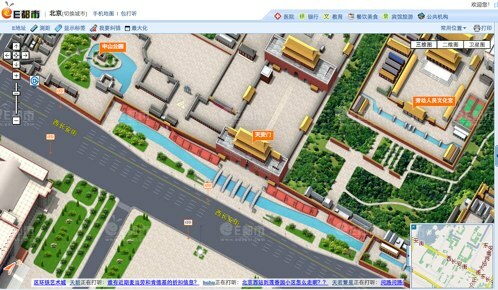 A view of Tiananmen Square using Edushi's Beijing map. For foreigners moonlighting in Beijing like myself, navigating the concrete jungle of China’s capital can be quite intimidating. Never to fear: The Beijing edition of E都市 (“E-dushi,” which essentially translates as “E-Metropolis”) is an innovative map providing satellite, two- and three-dimensional views of Beijing streets, buildings, tourist attractions, parks, and even transportation. Although currently only available in Chinese, the site includes flashing yellow bus icons that demarcate bus stops and, upon clicking, reveal bus route information. A few more clicks will get you visualization of bus routes as well as directions to final destinations. This unique feature will do wonders for expats like myself who often rely on haranguing innocent bystanders to decode Beijing’s intricate bus system.